London Green500 is an exciting project I’ve been working on for the last few months. The full details of the programme for the London Development Agency will go out next week. In a nutshell its a Carbon Management program for large organisations in the London area – aimed at reducing CO2 emissions by 1.5 million tonnes over the next couple of years. Today the marketing site went live (which is mainly a Content Management System), later in the month the Customer and Administration parts will go live. This post also has a bit of an ulterior motive – getting the site into the search engines – as its brand new and I know my blog is crawled by Google etc. From a development standpoint the Customer and Admin areas are more exciting as they are powered by the “AEA Framework” which is major initiative I have been working on since I joined AEA earlier in the year as Architect/Senior Developer. Zend Framework (and therefore PHP5) powered, with Smarty for views (of the MVC part) some nice templating and other modules to support the various projects at AEA. When I can spare a bit more time I’ll post some more stuff on the AEA Framework. All I say for now is that at the moment I’m putting the finishing touches to what we are calling Advanced Forms. Forms that (as an Administrator) you can edit via the site right down to the field and validation level. So you can build complex multi-page forms and ultimately processes with less code – actually mostly from the site itself). We are also integrating YUI components such as the Datatable. Can’t wait to write more about it! It made it on to the BBC news site too – which is good news. 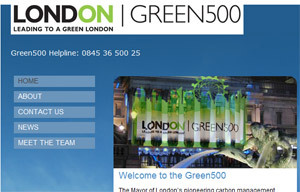 2 Comments posted on "Latest project – London Green500 goes live"